Varleisha Gibbs, PhD, OTD, OTR/L, has created a unique, evidence-based resource for helping children who have trouble self-regulating, staying focused, managing their senses and controlling their emotions. 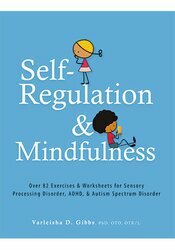 Based on the latest research in neuroscience, Self-Regulation & Mindfulness provides highly practical, kid friendly lessons to teach therapists, parents, educators and children about their brain and body, so they can build the needed skills to self-regulate. "I love this book. Dr. Gibbs used the latest research to put together programs for your children with Sensory Processing Disorder, ADHD and autism. The exercises are simple to do, the text is clear and well illustrated, and the relevant theory behind each program is explained in simple terms. This is a must-have for your practice or classroom!"